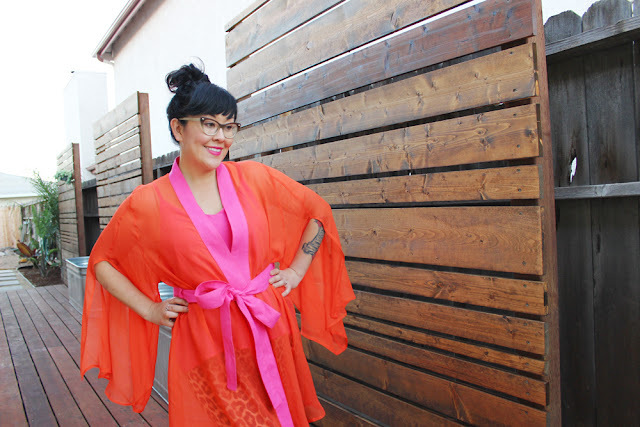 Britex silk chiffon = conquered! Back in 2012 (I think?) 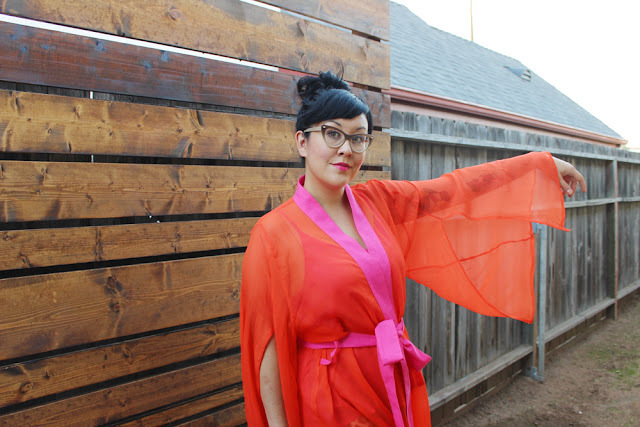 I sewed with silk chiffon for the first time and it was a total disaster (not trying to quote Donald Trump here, but it was). I didn't realize then how big of a disaster, but now that I have learned more about sewing I felt ready to try again. Round two was a success. The fabric in this post was generously given to me by Britex Fabrics in San Francisco, California. It's so cherry, isn't it? 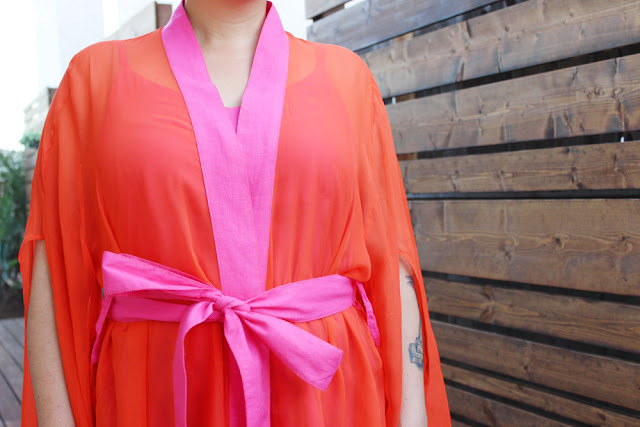 Initially I was terrified of this silk chiffon, but after deciding that I badly wanted an orange silk Named Asaka Kimono in my life I knew I had to step out of my comfort zone and make this combo happen. And I'm so glad I did. Worth the extra effort for sure. Sewing with a slippery fabric can be tricky, so I did a lot of research and felt much more confident about silk. If you'd like to read my tips, tricks, and revelations please head over to the Britex blog where I wrote a blog post allllll about it. Of course, it didn't hurt that I was using a high quality fabric that was perfectly on grain, but in conclusion: it's not as bad as I thought it was going to be once I was prepared with the proper supplies and knowledge. Cutting and taping pdf patterns. Not having AC during the summer. Neegan from the Walking Dead (such a psycho jerk!!!!!!). The neighbor who would climb onto our trash cans to pick avocados from our tree. Well, take number one on my list (cutting and taping pdf patterns) and times that by ten. That is how I feel about putting in all that work and THEN having to trace the pattern pieces because they are tiled on top of one another. Yeah, I know that I could have taken the pdf to the copy shop and had them print it out, but it was going to be $$$$$$$ and that made me annoyed too. THEN I realized after taping, cutting, and tracing that I needed to add 1/4 inch seam allowance to the pattern pieces if I wanted to use French seams.... @&*#^@!(#^$)!@^$. Alright, now that I've got that complaining out of my system. I'll work on my PMA for the rest of the post, promise. Sewing the fabric went really really smoothly. Like, "too good to be true" smoothly, so shout out to my extra prep work and this silk. The directions for Asaka were great too. I think the pattern would have came together really fast if it wasn't for the French seams, but they were necessary, as the fabric is super sheer. The only minor changes I made, other than the French seams, were to add some extra top stitching around the collar and to make the belt loops bigger. Not sure if that last change was a good one, but oh well! This garment is going to get a lot of wear when the weather is hot, it breathes beautifully and feels amazing on my skin. 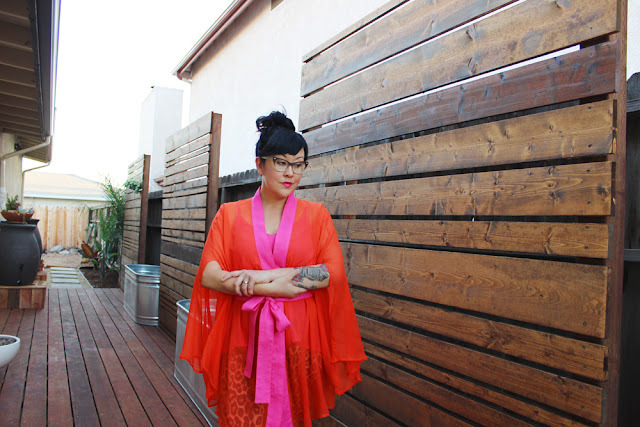 Underneath the kimono is a True Bias Ogden Cami made in cotton voile. I didn't get any solo shots of it, which is my bad, but it is the same fabric that I used for the collar and belt of the kimono. 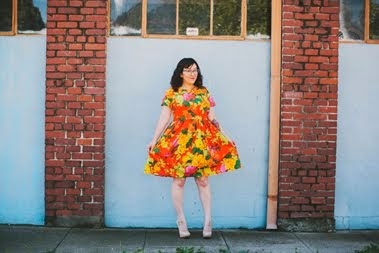 The pattern was a super straight forward sew, a great day project. I don't have much to say about it other than I like it and will probably make a few more as layering pieces. It's so nice to have a pattern for a wardrobe basic. Sometimes it seems like the simple pieces are the ones people buy from fast fashion stores, so it is awesome to have the option to make this instead of purchase.